The GTW - B weighing system can be mounted on all electrical stackers and has a high accuracy which makes a legal for trade version possible. The weighing stacker consists of two components. The carriage plate and the forks are modified for the mounting of 6 load cells, 1,000 kg capacity each. Onto these load cells the fork shoe is mounted. 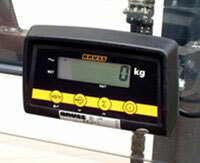 Without moving parts this construction guarantees a robust weighing system. The load cells and cables are completely protected. The indicator and optional peripheral equipment, e.g. 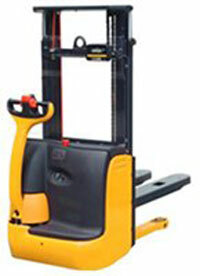 a printer, are installed in such a way that the readability is optimal and the stacker truck remains easy to operate.